Heavenly ski resort in Lake Tahoe announced that it will remain open until Memorial Day. Due to record-breaking snow totals in February and more snow throughout March, including multiple snow days expected this week, Heavenly is among the many Tahoe ski resorts that has pushed back its closing date due to the huge amounts of snow. The Memorial Day closing announcement came Monday (March 25). Located in South Lake Tahoe, Heavenly Mountain’s recent announcement includes the last three weekends in May: May 10-12, May 17-19 and concluding the season with an even longer weekend of skiing and snowboarding Lake Tahoe on May 24-27. The final four days is Memorial Day weekend. Prior to shifting toward weekend availability, Heavenly will remain open seven days a week through Sunday, April 28. Thanks to record-breaking snow totals in February, all three Vail Resorts in the Lake Tahoe region – Heavenly Mountain, Northstar California, Kirkwood Mountain – announced Feb. 28 that they would be staying open later this season. Heavenly Mountain: The South Lake Tahoe resort plans to extend the season through May 27, with four bonus weekends in May. Northstar California: Located off Highway 267 in Truckee, Northstar plans to extend the season through April 21. Kirkwood Mountain: The resort off Highway 88 will continue its season through April 14, then conclude the season with a bonus 3-day-weekend April 19-21. 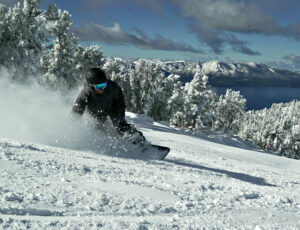 Skiing and snowboarding Lake Tahoe has never been better this season in terms of snow conditions. During the month of February, Northstar received 286 inches of snow, Kirkwood recorded 271 inches and Heavenly’s monthly total was 269 inches. Many Tahoe ski resorts have pushed back their closing dates this season. Below are a few. Squaw Valley Alpine Meadows: The announcement came in early March that Squaw would remain open through July 7. Staying open into July is nothing new for Squaw Valley, which typically is the final Tahoe ski resort to shut down for the season. This year is no different for Squaw, thanks to huge storms in February that have made other Tahoe ski resorts also push back their closing date for skiing and snowboarding Lake Tahoe. Sugar Bowl: The resort off Interstate 80 at the Norden exit decided to extend the season to April 21 and perhaps beyond. Sugar Bowl surpassed 561 inches of snow by March 8. Sugar Bowl ski resort will stay open at least until April 21 and perhaps longer, conditions permitting. 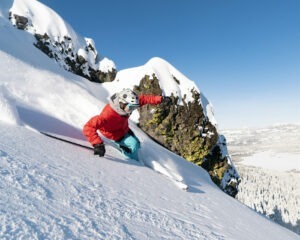 Diamond Peak: Even smaller, family-friendly resorts like Diamond Peak decided to offer more skiing and riding this season. The ski resort in Incline Village announced in March that it would be running lifts until April 21. “We’ve had big winter storms this year, so the snowpack is in great shape and the spring skiing is going to be really fun,” Diamond Peak general manager Mike Bandelin said earlier this month. Homewood Mountain: Another intimate Tahoe ski resort, Homewood also announced that it would push back its closing date to April 21. By March 4, Homewood had 540 inches of snow. “Thanks to the tremendous snowfall we’ve experienced so far, we are excited to extend our season two more weeks this winter,” announced Kevin Mitchell, general manager of Homewood, the first week of March.